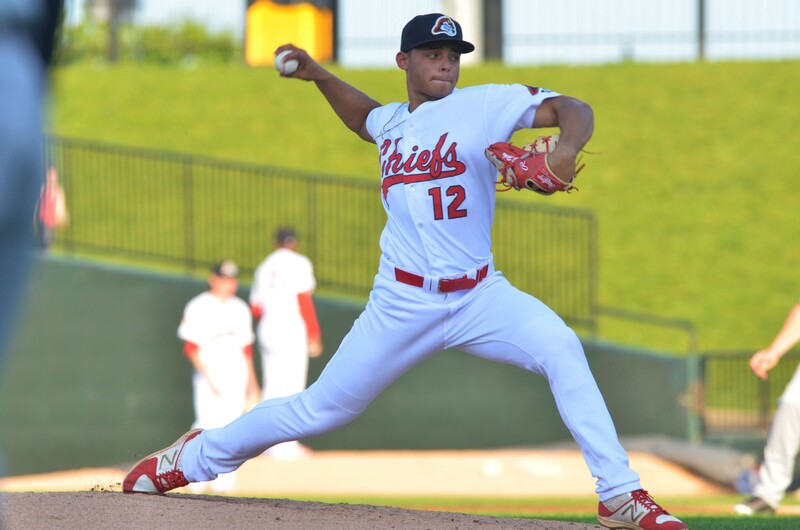 Jordan Hicks started last season in the Midwest League, pitching for the Peoria Chiefs. He’ll start this season in the National League, pitching out of the bullpen for the St. Louis Cardinals. That’s according to St. Louis Post-Dispatch writer Derrick Goold, who reported the Cardinals decided to add the 21-year-old power pitcher to their Opening Day roster after his electric outing Sunday. Hicks’ fastball reportedly reached 102 mph during his four scoreless innings in that game. Hicks made 14 starts for the Chiefs last season, going 8-2 with a 3.35 ERA, 63 strikeouts and 39 walks in 78 innings. He also pitched in High-A last year, posting a 1.00 ERA with 32 strikeouts and six walks in 27 innings (eight games/five starts) for the Palm Beach Cardinals. Baseball America has him ranked fifth among all Cardinals prospects in the publication’s 2018 Prospect Handbook. This entry was posted in Florida State League, Midwest League, Palm Beach Cardinals, Peoria Chiefs. Bookmark the permalink.